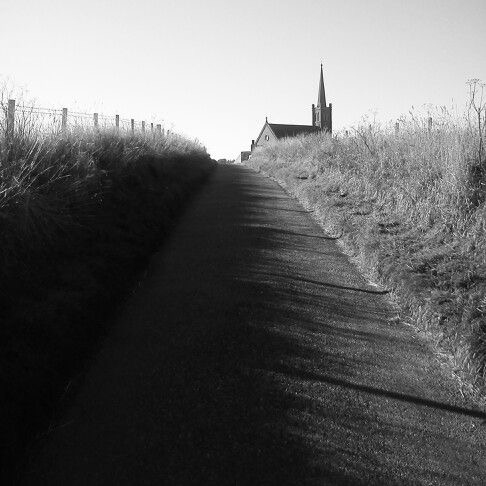 St Cyrus, formerly Ecclesgreig, a parish, with a village of the same name, in the extreme S of the county of Kincardine. It is bounded NE by the parish of Benholm, SE by the North Sea, S W by Forfarshire, and NW by the parishes of Marykirk and Garvock. Along the sea-coast the boundary is natural, as it is also at the S corner and along the SW, where, as noticed in the article on the parish of Montrose, it follows for 4 miles partly the present and partly an old course of the river North Esk. For 2&frac78; miles on the NW side it follows the course of the stream running along the Den of Canterland, and elsewhere it is artificial. The shape of the parish is a rectangle with irregular sides, the greatest length, from NE to SW, being 5¼ miles; and the average width, north-westward from the sea-coast, 2½ miles. The area is 8718.608 acres, of which 390.561 are foreshore and 78.698 water. The surface lies on the slope from the hill of Garvock to the sea, and is broken up into a series of undulations running from NE to SW, attaining 486 feet at the Hill of Morphie, and 600 near Maryland in the NW corner of the parish. Almost the whole of the surface is under cultivation or woodland. The soil is everywhere a good sound loam, strong in some parts and light in others, but very fertile. It lies on a subsoil of decomposed red sandstone or volcanic rock, varying from clay to gravel. The underlying rocks are Old Red Sandstone - which is quarried at Lauriston - or interbedded volcanic strata, which at Denfinella and elsewhere contain very fine agates and other minerals. In the Den of Canterland fish remains are found in the shales constituting the upper fish bed of the Old Red Sandstone of Forfar and Kincardine. There are also, at several places, bands of limestone which are not now worked, though former quarrying operations in connection with them led, at the Ecoruer of the sea-coast, to rather disastrous results. `On the Kincardineshire coast,' says Sir Charles Lyell, `an illustration was afforded, at the close of the last century, of the effect of promontories in protecting a line of low shore. The village of Mathers, 2 miles S of Johnshaven, was built on an ancient shingle beach, protected by a projecting ledge of limestone rock. This was quarried for lime to such an extent that the sea broke through, and in 1795 carried away the whole village in one night, and penetrated 150 yards inland, where it has maintained its ground ever since, the new village having been built farther inland on the new shore;' and this new hamlet had to be protected by a stone bulwark. 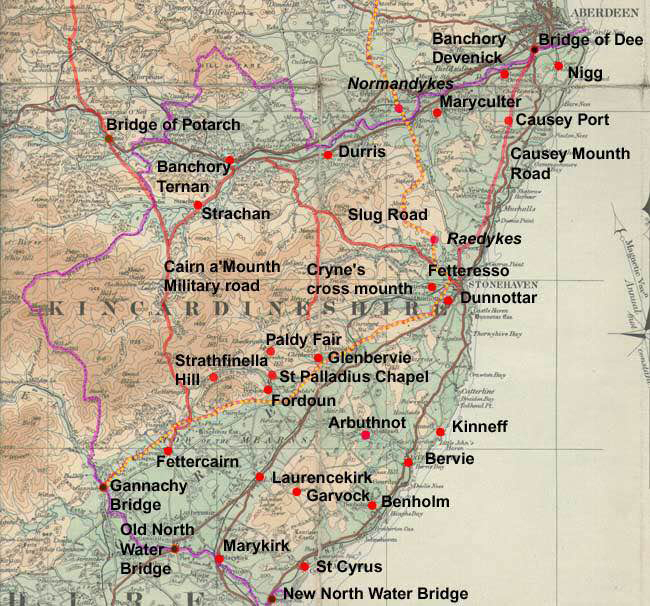 In the SW the drainage is carried off by the North Esk and the burns of Canterland, Morphie, Dannies Den, and Commieston, which flow into it. To the E of the village is the small burn of Woodston, and in the NE end of the parish are the burns of Lauriston and Denfinella, all flowing direct to the sea. The Esk and all the other streams flow through deep and romantic dells, the gorges of the burns of Lauriston and Denfinella being particularly fine and well-wooded. The latter, in which there is a high waterfall, and which is spanned by a very lofty viaduct of the Montrose and Bervie railway, is separately noticed. 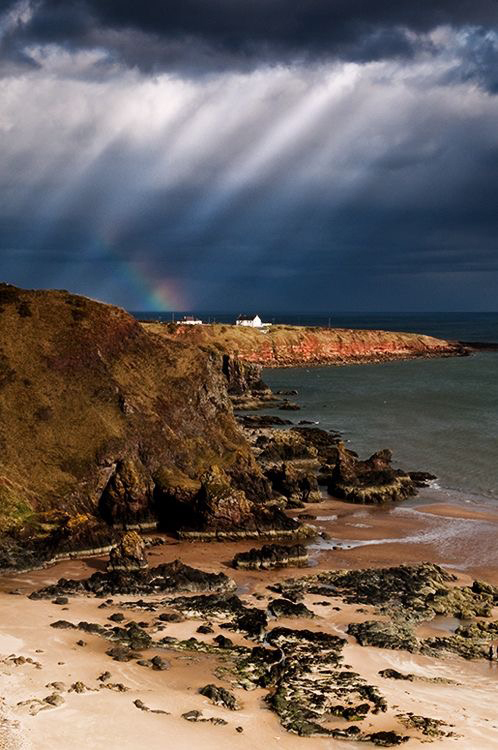 From the centre of the coast-line south-westward to the mouth of the North Esk there is a stretch of sandhills, bounded on the NW by an old line of cliff, in some places from 150 to 200 feet high, but gradually becoming lower as it approaches the North Esk. The view from this across towards the Red Head and away beyond by the Isle of May towards the Firth of Forth is very fine. 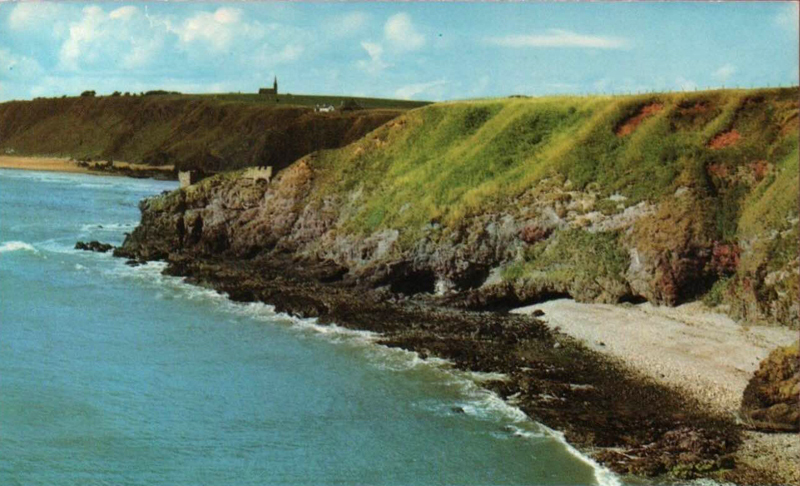 In 1858 a cave of considerable size, with many bones and heaps of edible shells lying along the floor, was discovered in these cliffs about half a mile from the North Esk, but was shortly afterwards rendered inaccessible by a fall of rock at the mouth. Near the river, in the stackyard of the farm of Stone of Morphie, is a solitary standing-stone, but nothing is known as to its history. It is traditionally connected with the Danes, and said to have been erected to mark the grave of one of their leaders - Camus - who was killed here, and whose memory is also preserved in the name of the neighbouring farm of Commieston, while the Danes themselves give name to Dannies (Dane's) Den. Several stone coffins have been found in the neighbourhood, but defeated armies have seldom time to bury their dead in stone coffins, much less erect memorial stones. Amid the sandhills, near the centre of the base of the line of inland cliff already described, is the small parish burying-ground known as the Nether Kirkyard. It was probably the site of the old Culdee church from which the parish derives its name, Ecclesgreig being `the church of Grig.' This Grig or Giric or Curig, whom Chalmers describes as Mormaer of the tract of country between the Dee and Spey, but who in reality was associated in the government of the kingdom of Scone with Eocha, who was the grandson of Kenneth mac Alpin, reigned from 878 to 889. As guardian to a king whose succession was disputed, and who was a Briton of Strathclyde, he seems to have tried to win over the clergy of the Scottish Church by freeing them from all secular exactions and services. 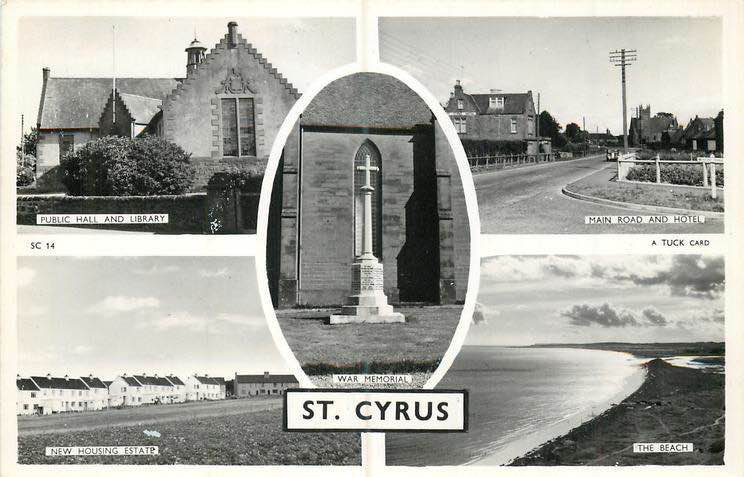 In the Pictish Chronicle his name appears as Ciricius, and as he seems to have been named after St Cyr or Ciricus, a martyr of Tarsus, the church was dedicated in honour of that saint, and hence the name St Cyrus. The church of `Saint Ciricus of Eglesgirg' was given to the priory of St Andrews by Bishop Richard (1163-77), and the grant was confirmed by King William the Lyon. The adjacent estate is still called Kirkside, and the old name is preserved in connection with Ecclesgreig House, the former name of which was Mount Cyrus. The church remained that of the parish till 1632, when a new one was erected on the site of the present building. A dependent chapel dedicated to St Laurence was at Chapelfield, ½ mile N of Lauriston House. At the point of Milton Ness, 1 ¼ mile E of the village, are the remains of an old castle called the Kaim of Mathers, said to have been built by Barclay of Mathers as a place of refuge from the vengeance of the law, by which he was threatened for his share in the slaughter of Sir John Melville. In October 1715 a band of Jacobites from Farnell and Kinnaird placed an Episcopal clergyman in possession of the church and refused the minister admission, nor did he preach again till the 5th February 1716, when `the rebels having all passed by this church,' he `repossest himself of his pulpit; but on this and the two following Sundays he had but a small congregation, the people not being able to leave their houses for fear of finding them plundered before their return by the Swiss and Dutch soldiers who were in the neighbourhood.' The principal mansions are Lauriston and Ecclesgreig. The former is separately noticed, and the latter is the residence of F. G. Forsyth-Grant, Esq. Lauriston was long in possession of the family of Straton, one of whom was `the stalwart laird of Lawriestoun' who `was slain into his armour scheen' at the battle of Harlaw. A later laird, George Straton, was one of the early Reformers. His brother David was burnt for heresy at Greenside in Edinburgh in 1534, and his son, Sir Alexander, was moderator of the General Assembly held at Aberdeen in 1605. The last of the family was Sir Joseph M. Straton of Kirkside, K.C.B., a Peninsular and Waterloo hero, who died in 1846, and is buried in the Nether Kirkyard. In the SE corner of the same burying-ground is also interred George Beattie (1786-1823), a lawyer in Montrose, and the author of John o' Arnha and other poems of some local celebrity, who was a native of the parish. 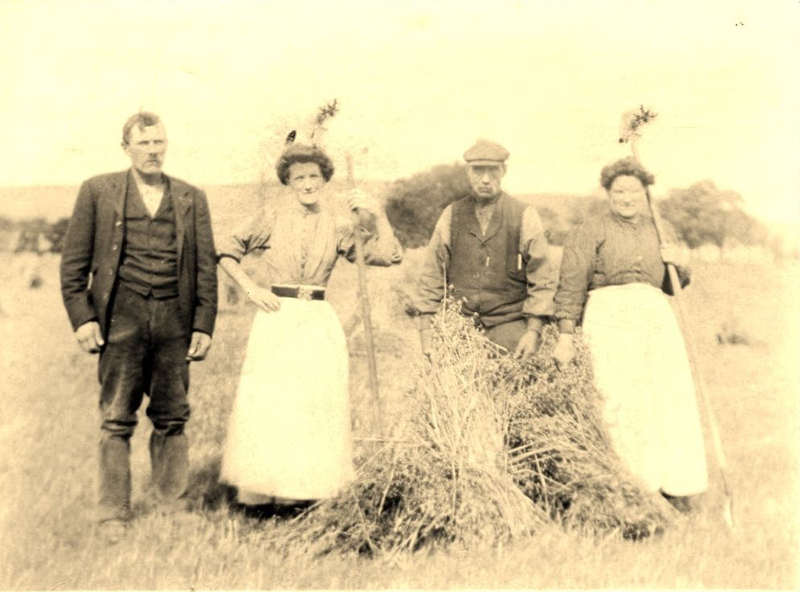 In a fit of despair at being jilted by a Miss Gibson, daughter of the then farmer at Stone of Morphie, he committed suicide close to the spot where now stands the tombstone erected to his memory `by the friends who loved him in life and lamented him in death.' Another distinguished native is David Herd (1732-1810), editor of the first classical collection of Scottish songs and ballads - Ancient and Modern Scottish Songs and Heroic Batlads (Edinb. 1769-74). The Rev. Alexander Keith, D.D. (1791-1880), the writer on prophecy, was minister from 1816 till 1840. The village stands on high ground overlooking the sea near the middle of the coast of the parish. 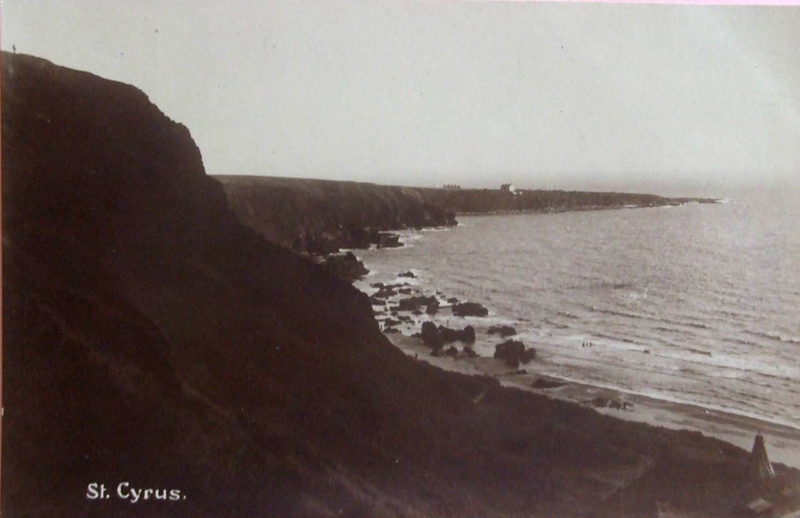 It has a post office under Montrose, and near it is the battery in connection with the St Cyrus company of the Forfar and Kincardine Artillery Volunteers. 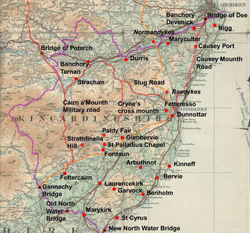 The parish is traversed near the coast by the main line of road from Dundee by Montrose to Aberdeen, which crosses the North Esk by a good stone bridge erected in 1775-80; and parallel to this road and between it and the sea is the Montrose and Bervie section of the North British railway system, with stations at the North Esk, at the village of St Cyrus, and at Lauriston, 3¼., 5¼., and 6¼ miles respectively N of Montrose. There are also a large number of very good district roads. The only industries are farming, and operations connected with the quarry already mentioned and with the valuable salmon fishings along the coast and in the North Esk. 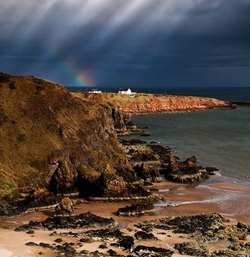 St Cyrus is in the presbytery of Fordoun and synod of Angus and Mearns, and the living is worth £357 a year. The parish church, at the village, built in 1853-54, is a good building with a tall spire, and contains 530 sittings. There is also a Free church with 500 sittings, built in 1844. 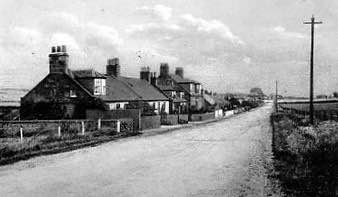 Under the school board the St Cyrus and Shortside schools, with accommodation for 222 and 39 pupils respectively, had in 1884 attendances of 154 and 38, and grants of £139, 10s. and £30, 3s. The principal landowners are D. S. Porteous of Lauriston, and F. G. Forsyth-Grant of Ecclesgreig, and there are several other proprietors. Valuation (1856) £12, 809, (1885) £17, 614, 13s. 1d., plus £2801 for the railway. Pop. (1755) 1271, (1801) 1622, (1831) 1598, (1861) 1552, (1871) 1585, (1881) 1487, of whom 728 were males and 759 females. Houses (1881) 330 inhabited and 33 uninhabited.- Ord. Sur., sh. 57, 1868.